For those following along with the debate over at the CardRunners league site, you’ll know that the topic of accuracy and precision of player “projections” (or whatever you wish to call your impressions of a player) has been involved throughout. There are those in the fantasy community who have taken to talking about “false accuracy” and how projections are merely a crutch, a security blanket, and that because we can never truly know what a player will do in the future, precision is unimportant. Regular readers also know that this is not something I believe to be true. The player knowledge is not “Vladimir Guerrero is projected to hit 25 home runs, drive in 100 runs, and bat .300.” These are lifeless pieces of projected data. Vlad could 27 HRs, or 22. He could bat .317 or .292. There are dozens of variables that may impact the actual numbers. The only knowledge that you can count on even a little is “Vlad Guerrero is a fading slugger who will get regular at-bats on a contending team.” Anything more definitive is pointless. Maybe, but by that logic, a 21 HR projection wouldn’t look so bad either, and I think we can all agree that a 21 HR projection for Miguel Cabrera would be way off-base. Perhaps we should just project that Cabrera will hit HRs “in the 30s.” It’s a wide enough range that not only covers our error bar—essentially taking into account some of the variability of playing time—but, oddly, also increases our accuracy. I’m more apt to be correct projecting Cabrera to hit HRs in the high-30’s than projecting him to hit exactly 37. Well, of course it’s going to increase our accuracy. We’re getting 10 guesses instead of one. “In the 30s” will never be wrong when “37” is right. I think the problem here (and perhaps I’m misinterpreting) is that we seem to assume that this error bar is static, that Miguel Cabrera has one fixed error bar and that we’re completely justified in projecting any number of home runs within that error bar, and that if we do this we’ll be fine. But that’s not true. Every number from 30 to 39 is going to have its own individual error bar. Because that “30 percent error bar” exists, if all we were to say is that “Miguel Cabrera will hit HRs in the 30s,” we must implicitly be saying that we’re projecting him to hit 35 HRs. Neither of these bars covers all the HRs in the 30s. So in actuality, by trying to remove precision, it seems that we may actually just be fooling ourselves. In trying to remove precision, we’re actually implying precision (strange as it is), but not the good kind that’s well thought-out. Rather, it’s the rounding-off kind. So if we’re going to be precise no matter what, why not make it count? Put me down for 37 home runs. My point essentially boils down to this: if you’re using a range of outcomes as your projection, you’re using an error bar. And if you’re using an error bar, you’re necessarily implying a precise projection—whatever happens to be in the middle of that bar. In a similar vein, Shandler posited in a March newsletter that perhaps we shouldn’t take consensus No. 1 pick Albert Pujols with the first pick in the draft. If I were to go into a public draft with the No. 1 seed and select Ryan Braun first, or Joe Mauer, or Carl Crawford … well, I’d certainly keep the bloggers and tweeters busy for a few days. Over the past six years, from 2004-2009, the player who was the consensus No. 1 pick has NEVER finished first. Never. This is a period when Pujols has been just as dominant as he is now. A-Rod was dominant during this time as well. Neither finished No. 1 in a year that the ADPs predicted they would. In three of the past six years, the player who DID finish No. 1 wasn’t even ranked in the top 15 coming into the season. Ichiro Suzuki, Derrek Lee and Jose Reyes all finished No. 1 in a year when they couldn’t crack the pre-season top 15. Yes, but how could we have known that Ichiro or Lee or Reyes would have been No. 1? Had we known, they would have been taken No. 1, wouldn’t they have? Or at least they would have been in the top 15. Just because a non-top 15 player has a good chance of finishing No. 1 doesn’t mean we know who it is. Sure, we could have guessed and taken Ichiro, but we could have just as easily guessed and taken Alfonso Soriano or David Ortiz and been wrong. Using hindsight to say that Ichiro should have been picked No. 1 is an example of the Texas Sharpshooter Fallacy. You have a decision to make on draft day. You can avoid public ridicule and select Pujols and Hanley as your top two picks. Or you can consider other options. You can go for across-the-board consistency with a Ryan Braun or Chase Utley. You can hop onto the rising trends of a Matt Kemp or Justin Upton. You can play the speed scarcity card with a Carl Crawford or Jacoby Ellsbury. You can play the position scarcity card with A-Rod or Joe Mauer. You’re probably reading this and thinking, Justin Upton with a No. 1 pick? Well, unless you are convinced he will come back to you in Round 2, remember that we would have been saying the exact same thing about Ichiro, Derrek Lee and Jose Reyes just a few years ago. To put it another way, it makes no sense to take a guy like Jacoby Ellsbury just because Pujols has some chance of not being the No. 1 player. Let’s do one more thought exercise using a graph of Pujols’ and Ellsbury’s expected value distributions based upon the “30 percent error bar” (assuming reasonable $40 Pujols and $33 Ellsbury projections). Sure, a scenario exists—and a somewhat likely scenario, at that—where Ellsbury is more valuable than Pujols. But we can’t take Ellsbury over Pujols just because in a few scenarios he could end up being more valuable. In far more scenarios, Pujols will be more valuable (and in one he’s almost $20 more valuable!). And this will be the case for every single player who is an alternative to Pujols (assuming you have Pujols ranked No. 1 on your cheat sheet, of course). If you like Jacoby Ellsbury better than Albert Pujols, sure, take him No. 1 if you can’t trade the pick and he won’t be there in the second round. But don’t take Ellsbury just because Pujols’ chances of finishing No. 1 are low in an absolute sense. I know it seems like I’m picking on Ron a lot here, but that’s not my intention. I have the utmost respect for Ron and what he has done for the fantasy industry. I used him for most of my examples precisely because he is such an influential figure, because he is at the forefront of this line of reasoning, and because he has been so vocal about it in recent years. I think Ron is a very intelligent and talented fantasy player; I just don’t agree with him in this instance. I take into consideration how many great players there are at each position. There are many more productive players at 1B than there are at 2B or, even more so, catcher. I would take Mauer first because even as low as the 3rd or 4th round, there will be a big bat available at 1B. Great article Derek. It was a patient and comprehensive rebuttal to Shandler’s misguided fatalist attitude. Wow. Shandler’s comments sound like he’s never played the game. It matters little that the #1 pick doesn’t turn into the #1 player. When drafting Pujols or Hanley #1 you are making the soundest bet that they will be #1 or close to #1. Taking Upton #1 is a higher risk play. He could be #1 or he could be #50. 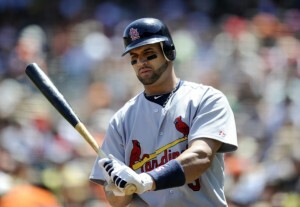 Pujols could be #1 or could be #10, I’ll take Pujols. The 30% error bar for Miggy is silly. He has two error bars – healthy and unhealthy. If healthy, his error bar is 10%. If unhealthy, it is unknown. To be fair, I think Ron mainly just wanted to stir up discussion over this matter. I don’t really believe if he would have ever taken a player like Justin Upton first in any straight draft league. @Mark – You should combine the two error bars you mention into one and get the 30% mentioned in the article. That needs to be built in from the start. One thing which is only taken into account subtly… You not only have to have personal rankings based on projections (or whatever you want, VORP etc) but you also need to “guess” what the rest of the league will do. You make rank Justin Upton as number 1 overall, but if everyone else has him at number 35 then you don’t need to take him number 1. Isn’t the issue with Pujols NOT that he has the greatest chance of finishing 1st, but that he has the smallest chance of failure? If you pick first and use Shandler’s “method” and take somebody like Crawford or Mauer or Kemp and he hits to the low end of his projected variance then you have probably torpedoed your team, whereas Pujols, even at the low ends of all his projections is still easily one of the top 30 players in baseball. When Picking high, your greatest goal should be to minimize risk. BTW, it should be noted that Shandler is not just blowing smoke with rhetoric. In a prestiguous league (I can’t recall which off the top of my head), he drafted Miguel Cabrera 1st overall back in 2008. If I recall correctly, that was just a mock draft and not a league that was actually played out. That being said, Ron did indicate that he would have passed on Pujols at #3 in the NFBC Main Event when there was concern over Albert’s health this spring. He ended up taking Braun. Ron practically invented the notion of taking safe, consistent players in the early rounds. The fact that Pujols is the safest elite player in the MLB player pool leads me to believe that Ron would always take him first. Ron also did have the first pick at the FSTA conference this spring and took Pujols, for what it’s worth. Again, just like his other weekly columns, this was simply meant to generate discussion. Seriously, Andrew, I assume your recollection is more accurate than mine, as I truly just remember much ado about Ron valuing M-Cab as the most attractive fantasy asset in his first year on Detroit. If I recall, it was a mock draft where he asked everyone if there was a good reason not to take A-Rod, then said he’d take Wright instead. Then he actually took Cabrera. I used CHONE this year to draft my fantasy teams. I don’t expect it, or any system, to be able to be precise at the individual level. However, on the team level, fantasy or otherwise, projections tend to function well. I’m not so sure that projections don’t function well at the individual level, it’s just that they are what they are. There’s a certain level of accuracy we can ever hope to achieve with projections (or with any evaluation method), and that’s something that we simply need to come to terms with. I don’t think that, because there’s inherent variation, that it’s best to forsake projections and embrace imprecision. I don’t care if my #1 pick finishes as the best fantasy player. My pick will ALWAYS be determined by VORP, and not by absolute value. I haven’t run the numbers, but my guess would be that Mauer and Hanley have higher VORP in 10- and 12-team leagues. Pujols may very well be the “best” fantasy player, but there are plenty of very good fantasy 1Bs. hanley over pujols all day. Terrific discussion. I’ll respond to specific points at a later time, since there is a lot here. One thing I will note now. I did draft Miguel Cabrera first in the 2008 FSTA experts league. I finished 4th.